Complete project management of shop drawing submittals from approval through fabrication & erection. 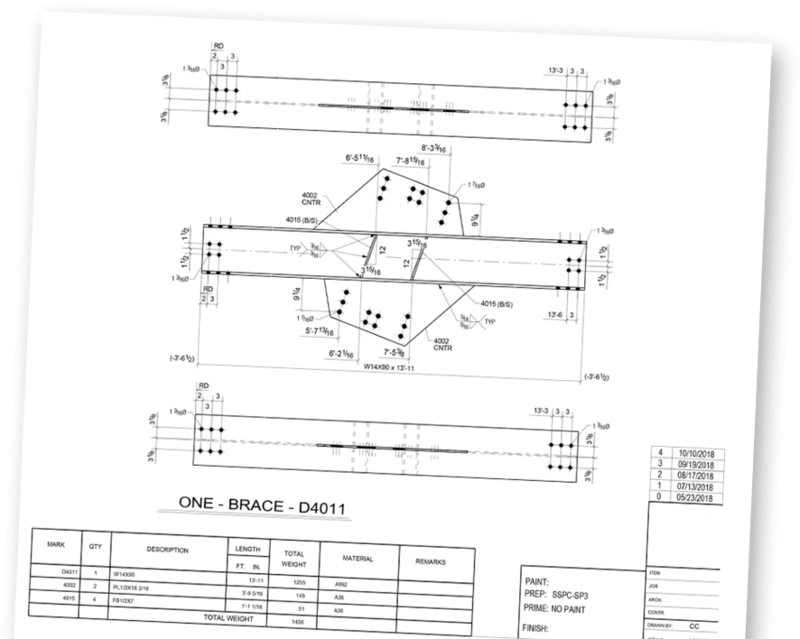 Drawings are sent electronically and can be supplied in a variety of formats. We offer many options for design drawing upload such as Google Drive or Dropbox. We can provide CNC, .dxf and .xls files, field bolt lists, and assembly lists on request and at no extra cost. Our difference begins and ends with our people managing your detailing project. When you contact CSD with a project that needs detailing you can expect exceptional service and attention to detail throughout the process. Our team of detailers and project managers pride themselves in keeping you informed during the detailing process and providing your shop drawings in a timely manner that reflects your schedule. From the moment your project begins in the detailing phase through the erection phase, our team of detailers and project managers work with the architects, engineers, and contractors (AEC) on your project to ensure a smooth transition and execution of each phase. Your project’s success depends on good communication between all teams involved. As your project flows through our detailing room, Requests for Information (RFIs) are forwarded efficiently and every effort is made to facilitate timely communication with engineers and architects, according to your desires, for the quickest handling of questions. 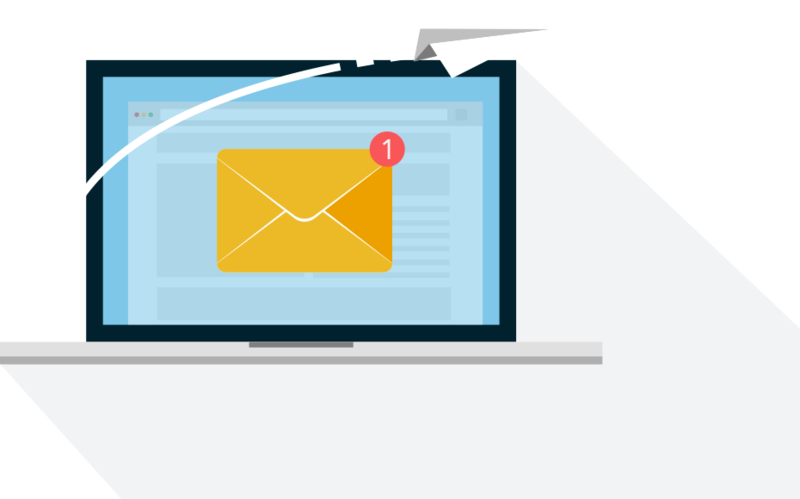 If requested, our project managers will communicate directly with designers to clarify and solve problems in order to keep the project on schedule. We seek to streamline the process so that detailed drawings can be delivered for approval in the quickest time frame possible. Our shop drawings meticulously and accurately specify every detail of the steel that needs to be made by the steel fabricator. The drawings include exact specifications for all components including sizes, dimensions, specs and all figures needed for fabrication. Upon completion of detailing, our experienced checkers take a "fine-tooth comb" to the drawings to ensure accurate details. Corrections are made and the drawings reach the fabricator in a cleaned-up fully checked state, ready to be submitted for approval. During the approval process, our detailers and project managers are always available to answer questions or clarify drawings. Once shop drawings are returned from approval, we guarantee a turn around of less than 1 week if there are minimal changes. If there are major design revisions we will assess and get an updated schedule of release as well as any cost associated with the changes. We can aid your project managers and estimators in getting an accurate assessment of the affects to your scope and cost so that change orders can be processed quickly and costs approved. Drawings are released to you in packages intended to streamline your organizing and procurement procedures. Each package will have assembly detail, installation drawings, part (gather) details, material lists (excel, .kss, .eje etc), bolt lists, as well as any automated fabrication files needed (.nc1, .dxf etc). Additionally, our Project Manager is always available to answer fabrication questions, split packages up as needed to facilitate site delivery, or any other question that you may have as you fabricate and erect the steel. CompuSteel is highly experienced in a variety of structural and misc. steel projects. We have detailed large projects of several thousand tons that require months of project management, RFI writing, and sequence planning, as well as unique misc. steel projects that require attention to small specific architectural details. We have extensive stair and railing experience and can provide your stairs detailed in either assembled stair runs or fully "knocked down" for tight conditions. 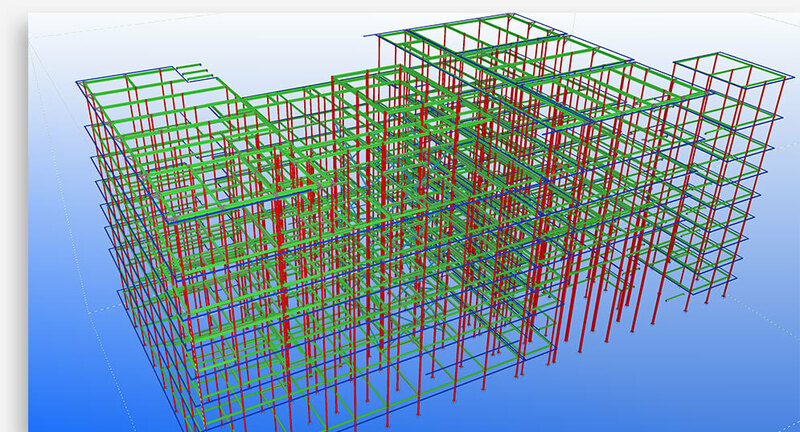 We can provide full engineering calculations for all structural connections and stair and railing towers or we can use your engineer of choice and coordinate with them to make sure the details match. 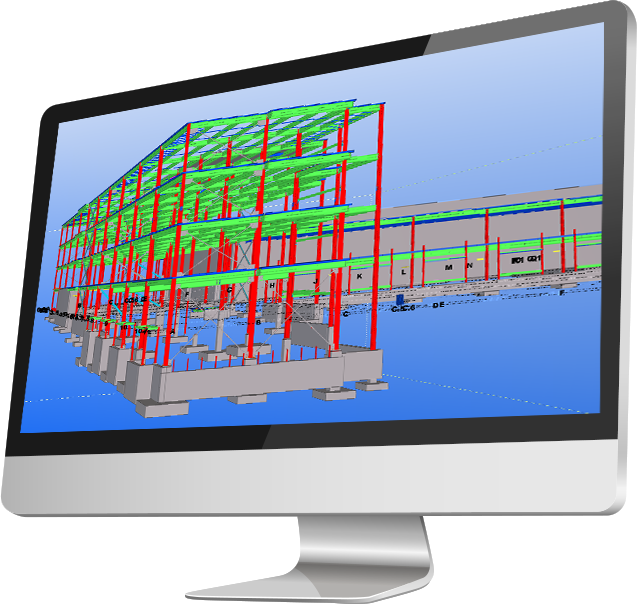 We can provide fully coordinated models adhering to your project's BIM standards. This model can be shared and integrated into the GC's or owner's model. This process adds real world cost savings for all stakeholders in the project life-cycle. 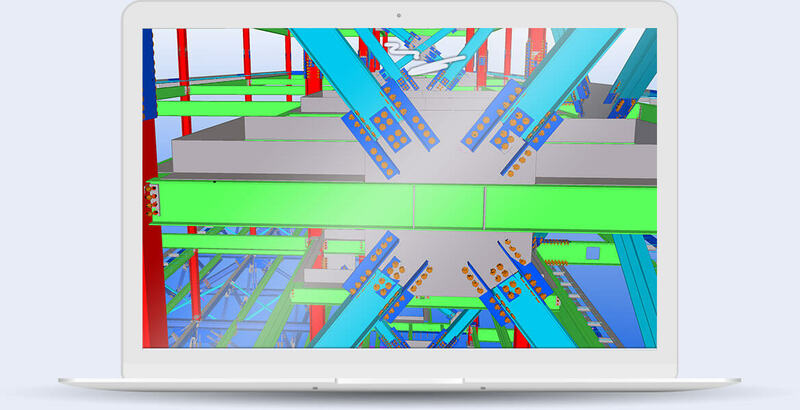 Additionally, our fully coordinated BIM models can help both your fabrication personnel, project managers, & site staff to understand a project's scope and complexities before they even step onsite. CompuSteel is well versed in BIM terminology and technology. Consider CompuSteel your BIM specialists. 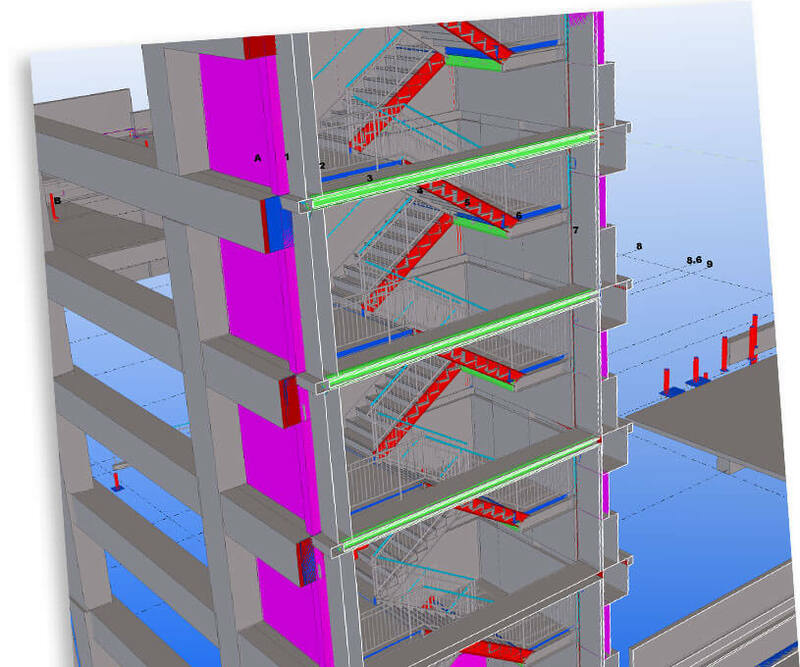 We work with several trusted engineers to design all aspects of your detailing project including steel connection design and steel stair design. We work with your preferred steel fabricator to design custom connections that suit their capabilities which improves efficiency and promotes timeliness and cost savings. We design steel connections with every phase of your project in mind: drawing and design approval, steel fabrication, and ease of construction during the erection phase. Our expertise includes: bracing, trusses, shear connections, non-standard shear connections, and specialty conditions including high-seismic conditions. Our steel stair design includes all aspects and components of the stair system including treads, stringers, handrails, landings, bracing, headers, posts, and specialty components. All components are designed and calculated to meet state and federal code requirements.